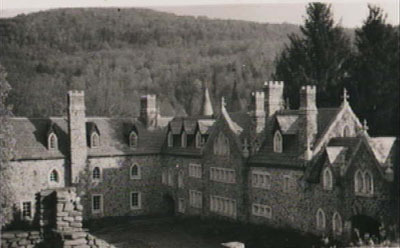 There seems to be more misinformation in circulation about the history of the Dundas Castle, Craig-E-Clare, than about any other structure in Sullivan County. I say that without hesitation, and as proof I will submit several weeks worth of material I have accumulatedfrom various sources in the country. I am still sifting through much of that information, but there are some things I am certain are true, and others I am certain are not. For instance: Ralph Wurts-Dundas, who built the castle prior to his death in 1921, was the granson of William Wurts, one of three brothers who built the Delaware & Hudson Canal. He was not, as so many rumors have persisted, associated with the Packard Corporation, nor was he of Scottish nobility, or the owner of other, identical castles throughout he world. Dundas' father,William Wilberforce Wurts,was one of 14 children of William Wurts. He was born in March of 1841,and graduated from the University of Pennsylvania in 1861. Wurts served as a Lieutentant Colonel in the 7th New York Cavalry during the civil war, and was subsequently appointed a diplomatic attache, living first in Italy, and then in France. Wurts married Anna Maria Dundas Lippincott of Philadelphia in June, 1868. She was the only daughter of Joshua and Agnes Dundas Lippincott, a sister of James Dundas Lippincott, and a niece of James Dundas. All were prominent folks. Upon their marriage, William Wilberforce Wurts, or "the Mayor," as he was known, had his surname legally changed to Wurts-Dundas. In 1907, he came to Sullivan County, where he purchased some 1,000 acres from silk manufacture Morris Sternback. Sometime thereafter, he began construction of Craig-E-Clare, his castle. He wouldnever see it completed, dying during the final stages of its construction. His wife, Josephine, was committed to a sanitorium owned by Dr. Flavis Packer in Riverdale in 1922. At the time her estate was said to be worth some $400,000. The couple's only child, Muriel Harmer Wurts-Dundas, married James R. Herbert Boone of Baltimore, Maryland in 1930. The wedding was considered "one of the most important of the summer, uniting members of families that figured prominently in the early history of this country." That's the information of which I am reasonably certain at this point. Much of it comes fom Don Allen of Roscoe, NY,who is heading up a town committee looking into refurbishing the castle. I have also found no evidence to support the story that Mrs. Wurts-Dundas lost her mind because of local towns- people's virulent objection to her habit of riding horse-back through the town, tossing gifts to the children. There are still a number of unanswered questions surounding the castle and its owners,including, but not limited to what brought them to Sullivan County in the first place, and the significance of the name Craig-E-Clare. I have some leads for nothing definitive yet. Many thanks to Wilmer Sipple,Don Allen,Evelyn Hass,Louis Hofer and Doris Bees for their interest in the topic and their assistance in accumulating information. I work in a Nursing Home in upstate New York and we are studying castles of the United States. I came across an topic on the Craig-E-Claire castle in Sullivan County, New York. I have been in this castle and it is in pretty bad shape. (vandalism) It was and still can be a great place if fixed up. The marble and stone work is magnificant. There's a fenced in court yard that the daughter was supposed to have been locked in, and the father built 3 heart shaped ponds on the bank to show his daughter that he loved her. You can still see the shapes of the ponds. The caretakers of the castle was the "Pomeroy's" , Not sure if they still are or not. It is located on Beaverkill Road outside of Roscoe, NY When you go down Beaverkill Rd you will come across and old iron fence and gates lined by big pine trees (Georgeous). The driveway is just passed it. It is private property and it is very run down. Basically it is condemned which is sad. If you go past the gates on Beaverkill road and look up to the left of the mountain you can see the walls and towers. It is very small. It has marble floors and fireplace in each room. Electric was placed in it but I would say it is old, old, old. It would be really beautiful fixed up. The story behind it I heard was that a man had built it for his wife and she went crazy or got really sick and never finished it before she died. It is really neat and very historical if you can uncover its past. The structure is listed on the National Register of Historic Places and is owned by a Masonic Lodge. I went to summer camp on the same property, Camp Eureka, almost 40 years ago. The Masons bought the property with the intent to open a home for the aged in the remote and tranquil setting of the Beaverkill River. My mother recalls touring the castle in the sixties and seeing the stone great room, spiral staircase, and beautiful guest rooms. She thinks it was a resort for Masons and had many overnight guests. In the off chance that the internet would offer information about the castle Craig-E-Claire I searched the internet and found your site. You see, my father, Eugene H. Martin and his wife, Babette, lived on the grounds of that castle at the time I was born, on April 12, 1941. Dad was caretaker of the castle and often showed by the wooden framed windows that he repaired during that time. He would give private tours of the castle once in a while. I still have a photo of it, I think one that was taken in 1939. My mother told me of how she would bathe me in the Beaverkill river, and I clearly remember the castle and the wonderful tall pines that led up to our house, which was the caretaker's house, where we lived. I seem to remember the intercom system, of all things, and Dad said how unusual he thought that was. He often talked about the marble floors. Dad told the story of a man whose wife was mentally ill, and how he built the castle for her. He definitely told me that he brought the castle stone-by-stone from Scotland, and that it was not finished before his wife died. He never said that she lived in the castle or was near it. I was recently at Craig-E-Clare Castle, or Dundas Castle, as I had known it to be. I had recently become a consoler there for this summer. And one of the consolers who had been there longer than me told me that it use to be a requirement to go to the Castle and well look through it. I had went in myself, but when we had brought some of the kids up there. There are alot of stories about that Castle. Like, one summer, every consoler that went up there had a horrible accident and had to leave camp before it was actually over. Also, one time, some of the kids went up there one night and strangely, the doors locked, trapping them inside until help was found. Only things is that the doors had no working locks or no locks at all. Then, the wife of the Mr. Dundas was said to be seen many times. She was seen in a white dress but was a blur. You'd only know it was her if you saw the white dress but that was it. Also, there is the shed of the Castle that no one wanted to tear down, saying that they saw "green eyes" inside it. And it is rumored that there are pictures of Mr. Dundas' wife where the eyes follow you. I did actually go inside the house. Both in the night and in the day. It is occupied with bats but mostly, the place is clean. No furniture but one room had significant vandalism. And the ceiling are low. But many rooms and bathroom. I did hear the stories of Mrs. Dundas to have gone "crazy" and I heard she was commited. But seriously, you don't want to spend a night over in that area. It gets pitch black up there, and it can make you very paranoid, especially when you go into that Castle. I didn't go into the cellar or the kitchen though. I heard some very bad stories about those specific places. But one more thing, about the hart shaped pools. I didn't know there were three, but from the entrance of the Castle, you can't see it. There is a steep cliff, and it is very dangerous. It can only be viewed from the highway. There are rumors that it fills with blood on a full moon. I don't know what to believe, but honestly, I think it's haunted. Though I won't mind going there again. I just went up to Roscoe, NY to see "Craig-E-Claire" castle. It is a really unusual castle. It sits on a smaller mountain overlooking a river and is surrounded by other taller mountains. The 25 ft tall, ornate gates of rusting wrought iron stand suddenly beside the rural road and a drive of dark hemlocks curves upward past the caretakers house -(who were nice and like to be asked to see the castle)... further up the long drive you come across the house beyond a field sitting amongst large dark pines at the edge of the mountain. You enter the estate through a porte cochere that has 3 story turrets on either side that contain within pale pink marble stairs in each. The arched porte cochere leads into a large courtyard. Within the arched passage there is a door to the left where you enter the main body of the house. There is a rather small, charming, entrance hall with the circular stairs peeking through a gothic arched door(as all the doors are shaped inside). Ahead there are stairs to a long low ceilinged drawing room with a decorative tiled floor and large crved and painted fireplace. Most of the windows have been broken - although the house itself is in pretty good shape. There is also a small study on this level, as well as the servant's wing with kitchen, pantry, refridgerator room, and butler's pantry wih dumbwaiter. The one end of the house appears to me to be a guest house attached to the main house and has seperate entrance through another port cochere and no access to the main house.Upstairs there seems to be about 8 or 9 bedrooms and numerous baths and dressing rooms. The floors are all marble, even the third floor floors. I really hope this house is restored, it is a real beauty. Medieval European style stone castle built by Ralph W. Dundas beginning around 1910. Construction ended in 1924, several years after Dundas died. It was never completed or occupied (though there are lovely finishes (paneling, trim, etc) , doors & windows, kitchens & baths, radiators, electrical & plumbing, in evidence and now fallen into disrepair). It was added to the National Register of Historic Places in 2001. Thanks to Elinor for sending the photo.